Carl Andersson, a sophomore at University of San Diego wrote this "A" research paper about the rise of the personality cult of Elena Ceausescu.It is published here exclusively with the express permission of the author - all rights reserved. Christmas Day 1989 represents for many Romanians the day of liberation, as it was the day when the dictator couple Nicolae and Elena Ceausescu were executed, and thus left Romania free after a 25-year harsh Communist dictatorship. Considered a most-favored nation by the West, what took place during their reign was something many in the Capitalist part of the world never were aware of. Not only had the Romanians been exposed to severe living conditions, but they had also been forced to love their leaders as they had built up an immense personality cult apparatus around themselves. The present study attempts to examine the trajectory of the development of Elena Ceausescus personality cult as manifested in various articles to be found on the Internet, four books concerning the Ceausescu issue, and a reference to the Romanian Communist Party daily, Scînteia. The period between 1970-1989 illustrates the gradual creation of Elenas public personality, obtained solely through the intervention of her husband and constructed in such a way as to represent the partys ideal type of a Communist Romanian woman. Elena Ceausescus personality cult was falsely built up with the help of a Ph.D. degree, party involvement, Central Committee positions, and propaganda. Elena Ceausescus life was a peculiar one  she started off as daughter of a poor peasant, to later rise quickly in power as her husband Nicolae became president of the Communist Republic of Romania  ending with her execution in 1989. Elena was born in 1919 to a poor peasant family in Oltenia, a rural region southwest of Bucharest (Lovatt 1). She only attended school for a couple of years before giving up and moving in with her brother in Bucharest, where she began working as a laboratory assistant and later on as a textile factory worker (Behr 68). She early joined the, by then illegal, PCR (Partidul Communist Român) but did not play a significant role until after WWII, when she in 1946 married Nicolae Ceausescu who by then was the leader of the Young Communists League (Behr 68). Until her husband assumed the position of General Secretary of the PCR in 1966, Elena was an anonymous figure rarely seen in public and occupied a secretary post of minor importance at the ministry of Foreign Affairs (Behr 140). However, as soon as Nicolae Ceausescu became the Romanian supreme leader, Elenas appearances in public rapidly increased. She soon became the head of the ICECHIM (Institutul de Cercetari Chimice) after quickly having obtained a Ph.D. in chemistry, by studying night courses at a municipal adult education institute (Pacepa 49). Her hunger for political recognition soon came to the surface: In 1968, Elena Ceausescu became a member of the Romanian Communist Party's Bucharest Municipal Committee. By 1972, she had become a member of the Central Committee, and in 1973, she reached the Executive Committee. In 1979, she became an ex officio member of the cabinet through her chairwomanship of the National Council of Science and Technology. By 1980, she was deputy premier, second in command to Nicolae himself (Lovatt 2-3). Clearly she became a high-ranked politician in a very short period of time. However, this career was only possible because her husband was the Romanian dictator. Elenas public life was made of manipulated information such as the creation of a false Ph.D., a political career thanks to the fact that she was the wife of Nicolae Ceausescu, and a eulogizing biased press. Elena Ceausescu had a poor education, she barely finished elementary school, but after her husband assumed power in Romania, she obtained a Ph.D. in Chemistry, became the head of ICECHIM, and was rewarded with vast foreign recognition. This would suggest that Elena was a serious scientist. However, after her execution in 1989, a former teacher of hers dared to show her flunky grades. At age 14 Elena dropped out of school after failing everything but needlework, singing, and gymnastics, and then moved to her brother in Bucharest and started working (Behr 67). In the capital she held a variety of unskilled jobs, yet she was not allowed to stay at any of them. At first Elena worked as a hired hand in a shabby laboratory, which some doctors and pharmacists had bought as a small apartment, producing pharmaceutical components such as slimming and headache pills. This was where her interest for chemistry arose. As this only was a temporary job, she soon began to work as a seamstress in a textile factory (Behr 68). In her free time Elena started to attend the meetings of the Young Communists League, together with her brother Gheorghe. At these meetings she met her soon-to-be husband Nicolae, an iron-fisted Stalinist. She didnt seem too keen on the ideology, but enjoyed the company (Behr 67). While Nicolae Ceausescu was beginning his rise in the PCR hierarchy, Elena worked as a secretary at the Foreign Affairs ministry, but due to her incompetence she was fired (Behr 140). This was her third unqualified job, and the second she was dismissed from, proving her lack of skills and education. Elena then began attending chemistry night courses at the Bucharest Municipal Adult Education Institute, but during an exam she was caught cheating and was expelled (Behr 140). Clearly, this was a person that was not meant for studying, her intellectual level being far from sufficient to study even at adult education night courses. Nevertheless, by 1960 she had obtained a Ph.D. in Chemistry after defending her thesis on the Stereospecific Polymerization of Isoprene on the Stabilization of Synthetic Rubbers and Copolymerization, and by 1965 she became the head of ICECHIM. However, there is no record of her ever obtaining a chemistry degree in advance of her doctorate, despite the claim that: It is almost impossible to reach a doctorate level on the basis of adult education evening classes (Corciovei, qtd. in Behr 141). Moreover, when colleagues from ICECHIM wanted to attend her doctorate oral examination they found the doors locked and were informed that the examination had taken place earlier that morning, Elena having sent her defense taped on film to avoid questioning (Behr 141). Thus, she received this Ph.D. because of who she was, not in consideration of her ability. Her need to convince the people of her knowledge is fascinating, yet tragic, as everyone knew she could not possibly have obtained a Ph.D. on her own, this being confirmed every time she spoke, even in public. President of the National Council for Socialist Culture and Education, from 1975. We were told: no paper could be written or published, no conference delivered publication could leave ICECHIM without Elena Ceausescus name appearing in first place [...] we were producing papers with words which, we knew, she could not pronounce, let alone understand (Corciovei, qtd. in Behr 184). I dont think you know, darling, but their university insisted on giving me an honorary doctorate. I kept refusing, but do you know what they did? The may be little yellow people [...] but they made Imelda [Marcos] take me there. What could I do then, darling? (Pacepa 181). This semi-humorous, but yet deadly serious, behavior does not belong to an academician that has achieved his or her position himself or herself, as they need not to prove their abilities. In Romania the situation was treated differently by the Communist media, which always eulogized Elena as Vice President, Comrade, Academician, Doctor, Engineer Elena Ceausescu (Scînteia 1). Obviously, Elena was by this point fulfilling one of the reasons for building up her personality cult: to be accepted in Romania as a scientist in her own right. As Nicolae Ceausescu became the General Secretary of the PCR and President of Romania, Elena wanted to become more than just a scientist, and thus her political life and personality cult commenced. Two years after her husband assumed power, Elena was elected member of the Communist Partys Bucharest Municipal Committee, and it would not take long before more important posts were given to her. The personality cult that rapidly grew along with her scientific and political success had as major outcome to promote her as mother, scientist, and political woman (Les 1). In early 1970 Elena Ceausescu had little public image, if any, as compared to her husband Nicolae Ceausescu. In the beginning she accompanied her husband on different visits having thus a mere entertaining role and being simply mentioned as his wife. The visit to China from 2nd June up to 25th, 1971, had a major influence on Elenas future ambitions to become a prominent figure in her countrys politics, imitating Maos wife in politics, media, science, and arts (Les 3). Thus, her presence gained increasing importance from 1971, when she accompanied her husband on most public occasions, from visits in different towns, and work sites in the country, to military parades and public demonstrations, but mostly abroad. On July 19th 1972, at the National Conference of the Romanian Communist Party, Elena Ceausescu was elected to full membership of the Central Committee, and from that moment on, she was nominated many other important titles. For example, in 1973 she became a member of the Partys Executive Committee (Les 3). Beginning with 1975, her name appeared in the titles, beside her husbands, even though her position had not drastically changed from a mere companion. Moreover, she organized receptions for guests of the country, and the images promoted a more relaxed and independent Elena. She also presided with Nicolae at Party and state ceremonies, traveled with him more abroad than in the country, and held formal positions directly below him in the political hierarchy (Les 4). According to the list of the Central Committee members, provided by the daily Scînteia the 29th November 1974, the 11th Party Congress elected 2 women out of 22 members: Elena Ceausescu and Lina Ciobanu, as members of Central Committee of the Romanian Communist Party. Another 7 women out of 205 members were elected for membership in the Central Committee, and 24 women out of 157 were elected for alternate membership (Les 5).These figures were only a façade for the political and scientific legitimization of Elena (Kligman, qtd. in Les 5). In 1979 she became an ex officio member of the cabinet, through her chairwomanship of the National Council of Science and Technology, and by 1980 she was first deputy Prime Minister and the most powerful figure in Romania after Nicolae Ceausescu himself (Behr 182). Beginning in 1979, Elena Ceausescus presence gained increasing importance, being presented as the second most powerful person in the party. In the late 1970s the Romanian press worshipped her almost equally as her husband. On her sixtieth birthday, January 6th 1979, she was praised for forty years of revolutionary activity, and Scînteia devoted two days of celebrations to her with titles like: Great Example of Devotion and Revolutionary Passion; Leading Fighter of the Party for the Glorious Destiny of Romania; Prestigious Contribution to the Evolution of Romanian Science, to the Cause for Peace and International Cooperation (Les 6). Although the Romanian press praised her, Elena Ceausescu was not a popular personality in most of the country. She did not project a practical competence like Eleanor Roosevelt nor the mystical charm and beauty of Eva Perón. 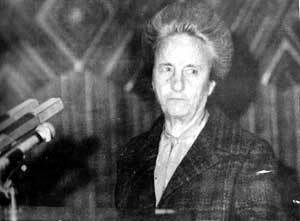 Even if Nicolae Ceausescus image had become extremely defiant and lacking in trustworthiness, it still remained more credible than hers did. Romanians would say he earned his high office, rising to the peak of power through hard work and political skill  while she was generally perceived as a dragon lady (Les 7). Naturally, this opinion was not expressed in the media, as everything had to pass through a vast censorship apparatus before publishing. We gaze with esteem, with respect, at the harmony of this family life. We attach special significance to the fact that her life, as a former textile worker, communist youth militant, member of the Party since the days of illegality, today hero of Socialist labor, scientist, member of the Central Committee of the PCR, together with her husband  offers an exemplary image the destinies of two communists [...] The three children of the Presidential couple work, like any of us, following the example of their parents, to bring socialism to Romania. All this attests clearly to the truth that work and personal example are obligations in the Ceausescu family (Behr 188). However, if the demonstrations really had been spontaneous other words and slogans would have been heard. In fact, there was one demonstration that resulted against Elena and Nicolae Ceausescu. In late December 1989 when the Eastern European Communist republics collapsed, Nicolae Ceausescu held a rally at Bucharests central square Piata Universitatii (Stanley 2). As the Ceausescus were praising scientific socialism the crowd started opposing violently, screaming down with the dictators, leading to the revolution that ended with the execution of Elena and Nicolae Ceausescu (Kaplan 98). This is a clear proof that such was the accumulated discontent and hatred towards the couple that no more could be tolerated. The events also show that notwithstanding the enormous personal cult Elena had built up around herself, she was not appreciated nor respected by the Romanians. In conclusion, while in the late 1960s Elena was sequentially shifting from scarce appearances in the background, to the mentioning of her name alongside her husbands, in the late 1970s she appeared as an independent woman and an important contributor to the scientific progress of the country. However, after investigating her true academic curricula it is not hard to see that Elena Ceausescu did not possess the proper intellectual capability to be able to obtain a Ph.D. in chemistry, thus making it clear that her scientific record was a hoax. Her political career was based on influence by her husbands Party achievements, and it is apparent that Elena Ceausescu rose to power only and solely by virtue of Nicolae Ceausescus role as leader. The Romanian nation was during the Communist dictatorship forced to love Elena whatever the circumstances, and her personality cult was made omnipresent by the newspaper Scînteia, that emphasized her intellectual capacity and political engagement. However, clearly biased, Scînteia was a Communist daily that reacted and produced only on direct orders issued by the leaders of the Communist Party  Elena Ceausescu. Public demonstrations in favor of Elena took place constantly. Loyal party cadres were bussed to where she was to appear and were provided with slogans and told what to chant. However the only, and last, public appearance that ended up against Elena was enough to overthrow her and her husbands dictatorship. This plainly proved that the appreciation of the personality cult built up around Elena Ceausescu was nothing but what it had originated from: duplicity. Behr, Edward. Kiss The Hand You Cannot Bite. New York: Villard Books, 1991. Cline, Austin. Romania: Cult Of Personality. Religion Around The World: 24 Jul. 1989. 5 Apr. 2002. Kaplan, Robert. Balkan Ghosts. New York: SMP, 1993. Les, Cornelia. The Emergence Of Elena Ceausescus Cult. Journal of the International Students of the History Association: 36.3 (2001). 25 Mar. 2002. Lovatt, Catherine. Women In Politics: The Legacy Of Elena Ceausescu. Central European Review: 1.3 (1999). 24 Mar. 2002. Pacepa, Ion Mihai. Red Horizons: The True Story Of Nicolae And Elena Ceausescus Crimes, Lifestyle And Corruption. Washington: Regnery Gateway, 1987. Rad, Ilie. The Stylistics Of Censorship. The Academic Center For Social Research: (1995). 15 Mar. 2002. Stanley, David. Eastern Europe On A Shoestring. Lonely Planet: (1991). 10 Apr. 2002. Verdery, Katherine. Nationalist Ideology Under Socialism: Identity And Cultural Politics in Ceausescus Romania. Berkeley: UCP, 1991.